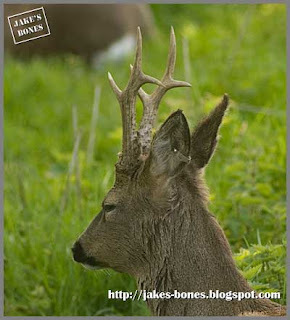 This is how roe deer antlers are supposed to grow. They have three spikes (or tines) on each antler with the first going forward and the other two going back. 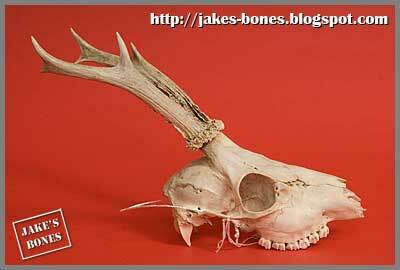 The antler is straight from the skull to the first tine then it angles back. 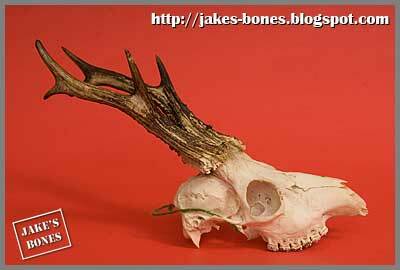 At the bottom of the antler is a thick ring with small lumps on it called a coronet. 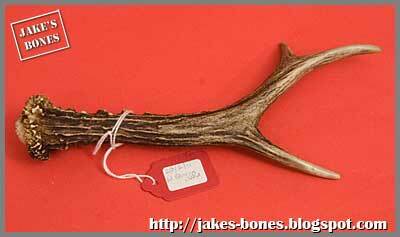 If you are lucky you can find shed antlers which are antlers which have fallen off. 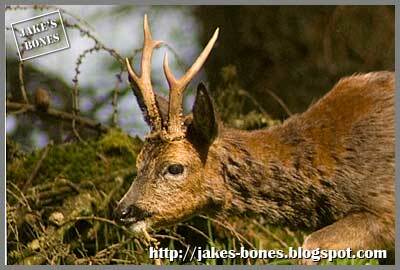 Roe deer antlers fall off every year around November. They are difficult to spot because they look like sticks. 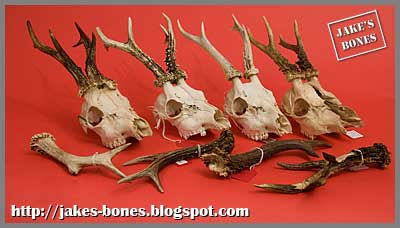 Now I have collected so many antlers and skulls you can see when the antlers haven't grown right. Here are some of the things I have spotted. This roe deer lives in the Pheasant Woods, and I saw him twice last year. The first time was when he was in velvet, and the antlers were still growing. 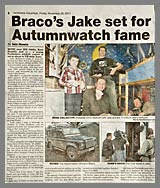 The second time was in the picture above. I knew it was the same deer both times because he had a broken antler. 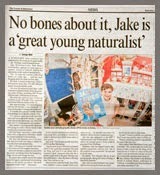 I wrote about him before when I wrote about roe deer antlers. When deer antlers start to grow the bone is soft and covered in a type of fur called velvet which keeps them warm and gives the bone blood. While the bone is soft, it can get broken, which is what happened to this deer, and must have also happened to the antler on this skull I found. Deer with broken antlers will find it difficult to find other bucks. Some deer can have a tine or spike missing from their antlers, like with this roe deer which lives in a wood on a huge moor near my village. It only has two spikes on the left antler but all three on the other. It can sometimes happen if the deer is young, or if the deer doesn't have a good diet, but it happens by itself. 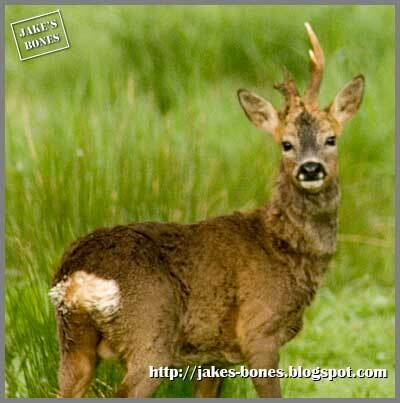 I wrote before about this roe deer which lived in a wood near the Roman Fort in my village. 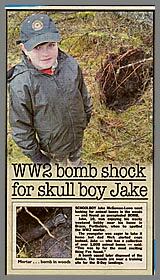 It died about a week after this picture was taken, and I collected the skull. The antler just stop where the first tine would be. I don't think the antlers had been broken. I think this deer was poorly, and the antlers just didn't grow properly. If you look at the picture on the left, the antlers were still in velvet when the picture was taken in April. The velvet should have fallen off by then. This roe buck lives in Duck Skull Valley in the Pheasant Woods. 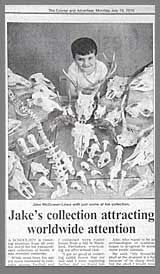 When my dad photographed it, he noticed the antlers didn't have a front tine (called a brow tine) and the shaft curved backwards. Last winter me and dad were exploring a new wood in the middle of a snowstorm when we met a gamekeeper we hadn't met before. 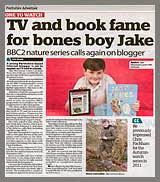 He recognised me from the television, and gave me two buck skulls. This was one of them. It has front tines, but the shaft bends back quite a lot the same way. This is the first roe buck skull I found with antlers and lower jaws. 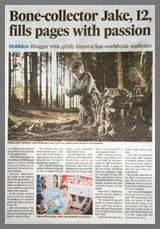 I found it while exploring a wood in the middle of a wood on the big moor. If you look carefully, you can see the right antler has been chewed. 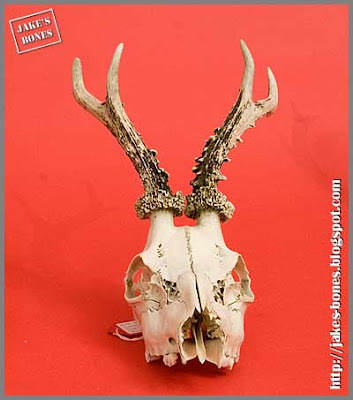 The roe deer would have been dead when the antler was chewed, but it hadn't yet rotted down because the skull and jaws were still together. 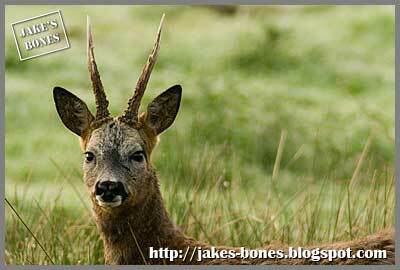 Another deer would have chewed the antler to get calcium, which is hard to find on moors and fields, but deer need it in their diet. 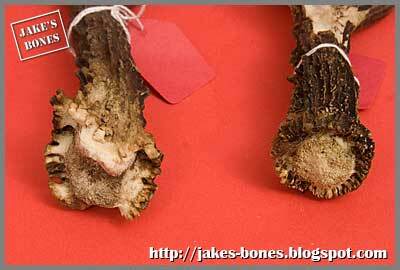 You can sometimes find bones that have been chewed by deer as well. 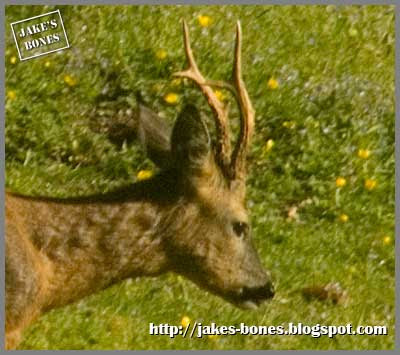 This deer has three tines on each antler but you can't see them because they are all behind each other. 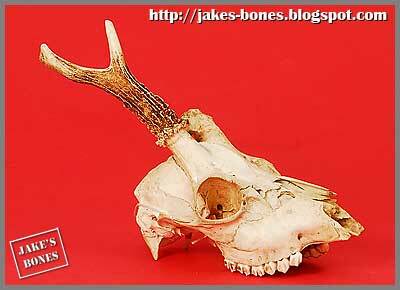 On the other skull, it has three tines on each antler, but only the top two are behind each other. Dad found this shed antler on the big moor, and it had been chewed a lot. But it also had an extra tine ! The one at the top on the left shouldn't be there. 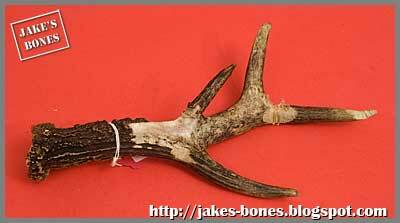 It's very unusual to find a roe deer antler with four tines. • The strangest antlers of all ? This skull came from the same wood as the roe deer skull with the lower jaws that I wrote about above. 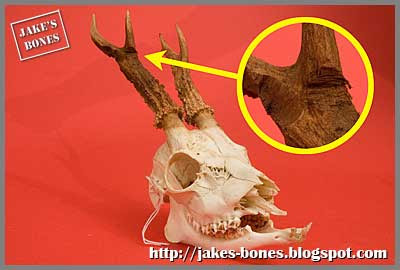 It is very, very unusual because of the way the antlers have grown at the bottom. This is what it looks like at the back of the skull. 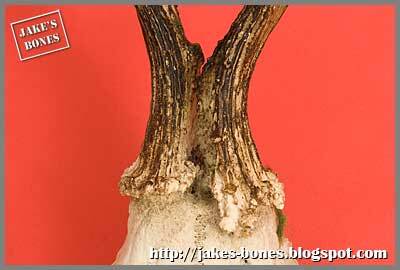 The bottoms are so thick they look like one big antler which splits into two ! 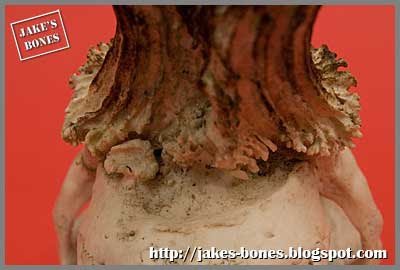 And the back of the braincase has been pushed in as if the antlers have forced the bone in. 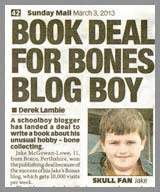 I have never, ever seen that before and it's really unusual. When the coronets at the bottom look like they have melted, this can be caused by the deer being old, and the soft antler not being held up properly as it grows. This called "going back". Here is a shed antler like this on the left, next to a normal coronet on the right. 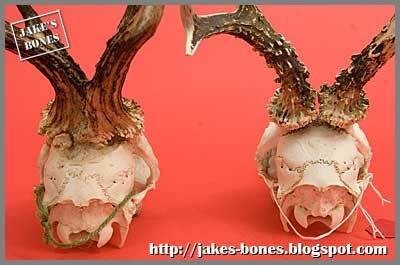 You can see the difference between the bottom of the antlers here, with a more normal roe deer skull on the right. At the front, one antler looks as if it further forward, even though the pedicles (which is what the antlers grow out of) are in the same position. People who hunt roe deer skulls prefer the antlers to be perfect. I like the antlers when they are a bit strange, because they are cooler and different to all the others. 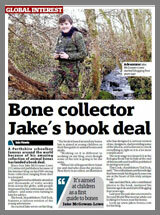 Amazingly well written story about the antlers of roe deer!